Of all the homecoming traditions, the one most important next to the football game is the election of the homecoming court. This ceremony brings back the previous year's royalty to crown a new group of winners in a ceremony that brings the entire school together. There are few high school traditions that can compare to homecoming. It's a time to celebrate your school spirit, make new friends and see the return of alumni from years past. There are floats to build, parades to march, and the big game just waiting to play itself out. Question: How Do Schools Decide Homecoming Court? Go to three different schools, ask how they choose their homecoming courts and you'll probably get three slightly different answers. Why such a difference? Some schools choose a homecoming king and queen, allowing the top runners up to fill out the court. Some schools elect royal representatives from each class. 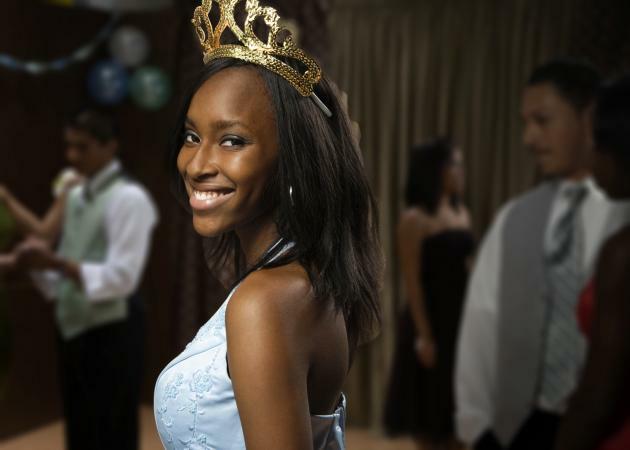 Some schools choose just a queen and several runners up as princesses to round out the court and let them choose their own escorts. A few schools even choose a king and his court, and then let the guys choose their own princesses. However, there is one tradition that nearly all schools hold in common. The privilege of becoming homecoming king and queen is reserved for members of the senior class. Who Votes for Homecoming Court? No matter which pattern a particular school follows, it's the students who generally have the final vote on who makes the court. Sometimes the student council has a significant say in who makes it into the finals, sometimes only seniors are allowed to vote in the final round. Other schools allow the entire student body to participate in the decision. The entire voting process usually goes something like this. Most schools put a few limitations on who can be considered for royalty. This is because the homecoming court is supposed to be an example of the school's best and brightest. Without the following guidelines, a few jokesters could easily turn the entire tradition into a complete mockery. Any student who wants to compete must carry a grade point average of at least 2.0. Additionally, participating students must have a good disciplinary record. Petitions are the kick-off of the entire voting process. Anyone wishing to run who meets the prerequisites listed above can circulate their own petition in hopes of getting enough signatures to make them eligible for the first round of voting. Petitions can also be circulated on behalf of someone you'd like to see nominated. Once the designated amount of signatures has been collected, they are turned in to the school office where they are checked, and the nominees are compiled. First round voting includes all candidates, and generally serves to narrow the field. Some schools simply provide ballot sheets with each candidate's name on them, and voting is carried out during class changes. Some schools actually allow candidates to do a little campaigning by providing a photo and a list of school activities they participate in. This can include things like being in the Honor Society, band, choir, sports and anything else that may be relevant. The idea is for candidates to show everyone why they are worthy of being considered. First round voting typically narrows the field to the finalists for homecoming court. The final round of voting decides the order of the court. The top vote getters become king and/or queen, and the rest of the court is selected in descending order. When it comes time to reveal the winners, the court is announced in reverse order up to the king and queen. Where the announcements take place is also up to school tradition. Many schools choose to play out the drama at a pre-game pep rally filled with homecoming festivities, while others hold the suspense until half time at the big game. Either way, the winners get a chance to hold court later on at the homecoming dance that evening. So there you have the answer to how do schools decide homecoming court. If you decide to run, you shouldn't worry too much about the outcome. Although being chosen is certainly an honor, the whole experience is one that stays with you for a lifetime. It's the kind of thing memories are made of.